I first met Jawed in 1994 in St. Paul, Minnesota. My friend Naimul Karim had been transferred by his employer 3M Company, from Germany to its corporate headquarters in St. Paul, and his temporary assignment had just become permanent. Although not altogether sure about settling down in the US, the Karim family had just moved to a new house. And Jawed, who was barely 15 had his own room. I saw Naim after a very long time and it was also the first time that I was meeting his wife Christine, Jawed, and his younger brother, Ilias. I had brought Jawed a sweatshirt autographed by Arnold Schwarzenegger that I had picked up at a charity auction in Los Angeles and Jawed was delighted. Schwarzenegger was the hero of all teenagers at that time and Jawed didn't know if he should wear it or frame it! “Come see my room,” Jawed said, and I dutifully followed him up the stairs to his room. It was a beautiful room -- bright windows, nice stained wood furniture, neatly laid out bed, desk and cabinets with a computer monitor occupying a prominent spot and jewel cases of CDs stacked neatly around. “Very nice” I said as I looked around. “All these” Jawed said, and waved at the neatly arranged CDs. “are my programmes”. “Very nice,” I said again and turned to walk back out. Kids, you, know! Always wanting to show off all their possessions! Jawed had my full attention. And that is when I knew that this kid was going places. Jawed came to the US in 1992 as a 13-year-old for whom, technically, English was the third language! Born in Merseberg in what was then the Deutsche Demokratische Republik or East Germany, Jawed was the first child for Christine and Naimul Karim who had met as students at the Martin-Luther-Universität Halle-Wittenberg in Germany, fallen in love and gotten married. Naim, who I should add has been at various times, my rival, my best friend, my roommate and many other things (we used to sit on the roof of his parents' apartment in the DIT quarters in Shiddheswari and act like we were not watching the girls on the neighbouring roofs), had moved to Leipzig, Germany in 1975, the same year that I came to the US. There, he had to learn German before entering the regular programme to get his “Diplom” (equivalent to Master's degree) in chemistry. Having to do your studies in a brand new language would be a big enough challenge for most people. But not Naim, who after all, stood first in the combined merit list for Dhaka Division SSC exams in 1972 (edging out his rival, friend and roommate by two marks). Naim had plenty of time to kill even after his studies and no longer limited to roofs, he managed to ask a beautiful, young German fellow student out for tea. They talked, and they talked some more and they discovered other things that they could do together and one thing led to another ... you know how it goes! Naim and Christine got married and a year later, they were graced with the birth of Jawed. Almost 30 years later, Naim is an accomplished scientist at 3M Corporation with 30+ patents to his name and Christine is an assistant professor of biochemistry at the University of Minnesota. (Another son, Ilias was born in 1989, also in Germany - “just wait till you hear about him” says Naim). But in 1981, although the iron curtain was getting fairly rusted, the Berlin Wall still stood and democracy and freedom did not rule in the DDR. While as a Bangladeshi citizen, Naim was free to travel anywhere, the same was not true for Christine and they longed to escape the regimented restrictions of the Deutsche Demokratische Republik. At the end of the summer, Naim bundled Christine and Jawed on to a train for Amsterdam, presumably on their way to visit Bangladesh. The train stopped at Frankfurt, the Karims got off and they never looked back. Aided by a West German policy that happily welcomed anyone who successfully scaled the wall, albeit figuratively in this case, Naim and Christine finished their studies, eventually getting their Ph.D.s in chemistry in this little town called Kaiserslautern between Frankfurt and the border with France. In 1985, Naim took a job as a product development engineer with 3M in the city of Neuss close to Köln. 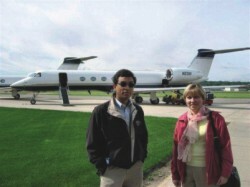 Christine and Jawed joined him six months later. But not before Jawed had spent an entire summer in Dhaka with his grandparents in Uttara! And during that summer, Jawed became a true Bangali. He loved it in Dhaka. In no time at all, he became fluent in Bangla. And to make matters worse, he completely forgot his native tongue, German! Speaking about it a couple of nights ago, when I was checking some facts for this story with Jawed over the telephone, I could almost see the smile on his face as he recalled that he did not want to leave Bangladesh at all! They had to put him on the plane kicking and screaming (“Na, jabo na! Ami jabo na!”). “I was crying, I think,” said Jawed in his customary low key way. So you see, English is indeed Jawed's third language! As a child, Jawed was like a sponge and the whole world around him was liquid. Everything that happened around him, he absorbed silently and completely. Early on, in Neuss, his elementary school teacher Frau Winkes took Naim aside. Asked about what is important, Christine puts it succinctly “to develop new things .... is our life”. Jawed learned early on ... how to develop new things. Still today, an occasional topic of good-natured rivalry at the Karim dinner table is who has more publications (Christine) or patents (Naim). I suspect that Jawed, who for the moment, lags behind in both those categories, might be ahead in one or two others. It was also in Neuss that Naim believes he made the best investment of his life. Walking through a flea market (an open air market for used knick knacks), Naim and Jawed spotted an old Commodore C-64 computer. On an impulse, Naim bought it, brought it home and set it up. Father and son played around with the computer and Jawed learned how to programme in BASIC. He was hooked and there was no turning back! The old Commodore was the first of many computers in Jawed's life but it still occupies a sentimental spot in the basement of the Karim home. Fast forward to Minnesota, circa early 1990s. Jawed spent a year at the Capital Hill Magnet School before moving on to St. Paul Central High, a large public school in St. Paul. A few years ago, Naim tells me, he ran into Ken Hanson, one of Jawed's old teachers who is now the assistant principal. Mr. Hanson grabbed Naim's arm and dragged him to his office. There, framed on his wall was a picture of Jawed that he has hung on to, long since Jawed graduated from high school. You could say that Jawed had left his mark! In high school, Jawed was like any other boy except that he wasn't! He was not tremendously into sports, preferring academic teams, math in particular, but with one exception. He loved to race bikes. He went for long distance rides -- 50 miles, 100 miles -- he'd think nothing of it. And his love affair with computers continued. The internet revolution was just taking shape and Jawed was all over it. He worked the net, making friends, writing programmes that he posted on forums and bulletin boards and chat rooms, free to anyone who wanted them. He did a lot of pioneering work with, what else, computer games, particularly, a game that used to be very famous some 10 plus years ago called Doom. And in doing so, he became known to many of the other budding net mavericks. 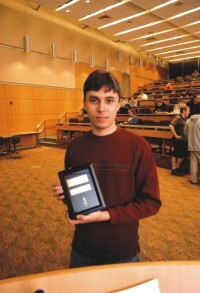 (“You're not the Jawed Karim?” asked his freshman college roommate when they first met.) But he never lost sight of the practical side of things. When his school was struggling with issues of communications, he and a classmate set up an e-mail system for the entire school. This was, mind it, long before e-mail had become so ubiquitous that sometimes you wish you didn't have it! The next time I heard from Jawed was late one wintry evening in 1999. We had just recently moved to Cincinnati after living in Los Angeles for 20 years and the onset of winter coincided with the onset of doubts in my mind about our move. What sane person leaves sunny southern California for the dead of a midwestern winter? No sane person indeed, was my answer to myself when I heard the phone ring. It was Jawed. A couple of years ago he had entered the University of Illinois at Urbana-Champaign, a hotbed of internet innovation and activity. It is in the labs of UIUC that Marc Andreessen and a couple of others created Mosaic, the precursor to what became known the world over as the Netscape internet browser. And it wasn't until Netscape's browser became widely available that using the internet became possible for more than the academic researcher. In a sense, it was Netscape's public offering in 1995, initially slated for $14 per share, bumped at the last minute to $28 per share, and closing on the first day at $75 per share that officially marks the beginning of the internet era. Jawed, no surprise, had followed his interest to the hallowed halls of UIUC where the young men (and the occasional women) who'd change the world were busy changing the world. It was the beginning of junior year (3rd year) at college and Jawed was torn about what to do. It seems that an upstart internet company called X.com (they were all upstarts or start-ups and often, both) had made Jawed an excellent offer. He'd be paid a princely salary and have an opportunity to join a happening bunch of guys on the proverbial ground floor. The catch? He'd have to drop out of school and move to Silicon Valley. So Jawed was calling me for advice. “What did your dad tell you to do?” I asked Jawed. “Oh! Let me call you back in a little bit,” I said. I hung up and called Naim. I wanted to make sure that I had my friend's permission before I told Jawed that this was an opportunity of a lifetime and he should grab it. And so it was that a few months later, Jawed found himself surrounded by a bunch of other youngsters in the heart of Silicon Valley who rightly thought that the world was their oyster. Jawed was one of the earliest employees of a company that is better known today as PayPal. The hours were long, the challenges were big and when the internet bubble burst, the going sometimes, was tough. But PayPal persisted and outlived competitive threats through the work of key architects such as Jawed and in 2002 was purchased for $1.5 billion by eBay which had tried but failed to build its own in house electronic payment processing arm. As an early employee (but not a founder), Jawed did alright. At the tender age of 23, he made enough money to never have to work again (if he didn't want to). But Jawed was just getting started. Over the next few years, Jawed and many of his core group of friends stayed at PayPal for a bit and then branched out. Jawed finished his undergraduate degree and got interested in many new and emerging concepts. Some quickly went nowhere while others are still going along and can still turn out to be big someday. Near the centre of these activities were these youngsters who had already earned their financial independence, learned the basic skills of entrepreneurship and had endless reserves of energy and ideas. Now they had the money to fund those as well. 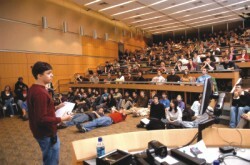 Jawed also decided that he wanted to pursue graduate studies in Computer Sciences and he enrolled at Stanford University. Three of these friends, Jawed, Chad Hurley and Steve Chen were particularly close. They'd meet often and stay up late, brainstorming at Max's Open Café or at one of their apartments, all located near Stanford. The idea of YouTube hatched from the three of them talking about how difficult it was to send or find video clips on the net. Something, clearly, had to be done -- and YouTube was born. Early on, the three founders had agreed that Jawed was not going to become an employee, choosing to remain a graduate student at Stanford and foregoing a part of his founder's equity stake in a deal that he views as a fair trade-off. He remained the official advisor of the new company and was instrumental in bringing in Sequoia Capital as the venture capitalists who funded most of YouTube's operating expenses. After an initial slow start, YouTube began to catch on. Net aficionados around the world took a liking to the fledgling site and soon, they were bombarded with postings of just about every kind of video you can imagine. Many copy cat sites followed, including one by none other than the 800 pound gorilla, Google. But YouTube had a full head of steam, a good lead, dedicated and hungry programmers and ideas and energy that easily outstripped everyone else. I spoke with my friend Naim earlier in the year when YouTube first began to draw attention. I did not quite understand the business model and wanted Naim to explain it. A few months later, YouTube videos were getting downloaded over 100 million times each day! Not wanting to take any chances, Google swooped in and signed up to buy YouTube for $1.65 billion. This time, Jawed was not just an employee, he was a founder. Once the deal closes, as the third largest individual shareholder of YouTube, he'll join the ranks of richest of the rich. I caught up with Jawed two days ago when he called me to check in. Naim had told him that I might do a piece on him and that I would like him to call me. Although he is 27-year-old young man, to me, he seemed still the bright-eyed innocent youngster, modest, calm and a little bit amazed at all the attention and commotion. “You know, all this is really not so important” he told me. “Every evening when I leave school or work, I step out and look up at the sky and I see the stars. Science has helped us a great deal but fundamentally, we know nothing really, about the bigger questions in life.” Jawed, I noted, has something few people his age do-- perspective. I asked Jawed if he had anything to say to all the youngsters, all the striving dreaming youngsters of Bangladesh who could perhaps be inspired by his words. Jawed thought for a while and said that he wasn't sure that he had anything profound to add to all the important things that have already been said. “Perhaps I should just quote Larry Ellison” (the billionaire founder of Oracle Corp.) Jawed said to me. Ellison, according to Jawed, said “I don't know of any place or any time where there aren't great possibilities.” Jawed feels that those are the words that I should convey to the people of Bangladesh on his behalf.